On a hill approximately 30 m. above sea level, Sanoudo built the castle of Hora, over the remains of the ancient acropolis, using freely material from the ancient town, which had been laid to ruins by the incessant pirate raids. Passing through the Trani gate, we enter the mysterious, medieval castle settlement, which was not only a residential area, but also the administrative, educational and religious centre for the Venetian conquerors. In the centre of the castle settlement there is a square with the Catholic Cathedral and the ruins of a tower, which it is said, was the Palace of Sanoudo. Next door was the school Ursuline nuns, the Kappela Kazatza and the business school, where the famous Greek novelist Nikos Kazantzakis studied for a year. 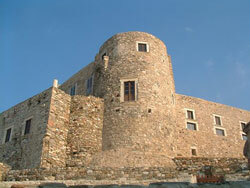 Nowadays the Archaeological Museum of Naxos is housed in this building. The wonderful mansions around the castle are inhabited, by Catholics who descend from the Venetians. Each one of these mansions has its own story and often legend. One of the old mansions (on the north-westerly side of the castle) is open to the public as a museum of the Venetian era. 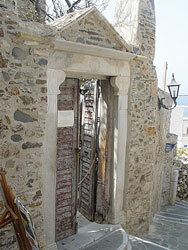 Exhibitions and musical evenings are held here, and many among those artists who exhibit are from Naxos. In the alleyways of the castle area, there are all kinds of shops, cafes and taverns.